Joey Chestnut won his 8th straight Nathan's Famous Hot Dog Eating Contest in Coney Island, swallowing 61 dogs in 10 minutes falling short of his own record. 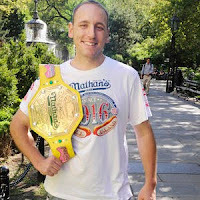 There was a new women's champion as Miki Sudo shocked three-time defending champion Sonya "The Black Widow" Thomas by wolfing down 34 franks and buns in 10 minutes. Thomas was only able to wolf down 27 3/4 hot dogs and buns. 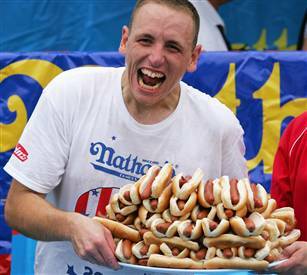 She still holds the women's record with 45 hot dogs and buns which was set last year. 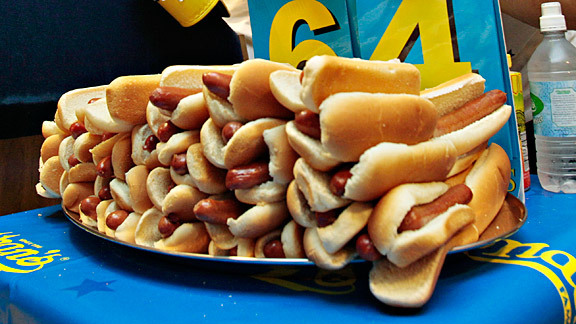 Check out this Sports Science video on what eating 69 hot dogs does to your stomach.